Vampire running! from Carl Zimmer on Vimeo. Watch this video of a vampire bat running. Do it. Most bats are pretty much helpless on the ground, but not the vampires. Mesmerizing, no? I sometimes write these little nonfiction booklets for people who are learning to speak English. My favorite ones to write are always the wildlife books, because I get to spend a lot of time watching Planet Earth, pretending that it’s “research”. But actually, the research is pretty fun, and I’ve learned a lot of amazing things. Did you know bat wings are covered in tiny, sensitive hairs that enable the creatures to detect wind flow? Or that some bats have to contract their ear muscles when they screech to avoid deafening themselves, because their calls (in a frequency undetectable to humans) are at the same decible level as a rock concert? This helps them stay aloft. Ever since I wrote my special on bats, they’ve been my second favorite animals (first place: orcas). I even asked my editor if we could increase the page count so I could include all the weird information I’d found. So if ever you want to feel kind of terrified and amazed by the scope of our planet, go read the wikipedia pages for bats and orcas. Seriously, do it. Video courtesy of Dan Riskin, Brown University. 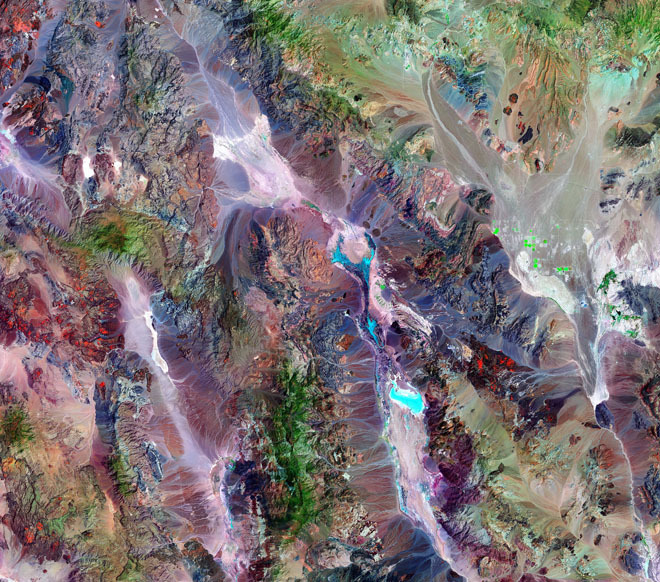 Wired has done an amazing photo series of American National Parks as viewed from space. Stunning, no? Featured above is my personal favorite, Death Valley in California/Nevada. Check out the whole collection here. On a related note, did you know you can buy passes for the National Parks? 80$ a year for unlimited access to all parks! With entrance fees at around 10-20$ per person/car, that’s not a bad deal. The Boy and I have often talked of getting one and doing the grand tour across the states. AND, even better, if you’re over 62 years old you can get an unlimited LIFETIME pass for 10$. TEN DOLLARS. To visit any National Park you want, whenever you want for the rest of your life? Sold. Boing Boing contributor Maggie Koerth-Baker conducted an excellent interview, “The Annotated Apocalypse,” with John Hoopes, an archeologist and professor of anthropology at University of Kansas. Hoopes gives a concise, lucid explanation of the “2012 Mayan Calendar Prophecy” that’s had everyone whose every flipped past the History Channel in a total tailspin for pretty much the last decade. In addition to clearing the air about what is real, not real, and possible regarding the 2012 doomsday predictions, Hoopes elegantly ties in discussions about the relationships between pop culture and science and spirituality (including the theology of Harry Potter), the “production of culture,” how we actively and continuously generate myths, and our power to believe in those myths even when they are not necessarily rooted in tradition. Check out the full interview, such a fascinating and insightful read!